Italian ryegrass (Lolium multiflorum) is an annual grass that can sometimes behave as a biennial or short-lived perennial in California. The species is upright in habit (to about 3 feet in height); seeds germinate in the late fall and the plants grow vigorously through the winter and early spring. Ryegrass can be identified by its dark green, glossy and hairless leaves that are rolled in the bud. Auricles are well-developed and the ligules are long and membranous. 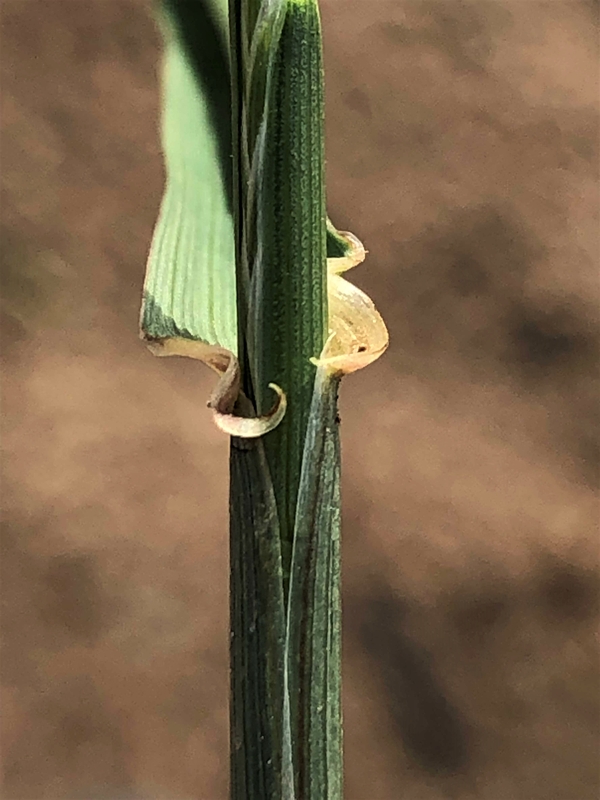 Once flowering occurs, ryegrass is easily distinguishable by alternating spikelets that run along the length of the main flowering stem (April through September). 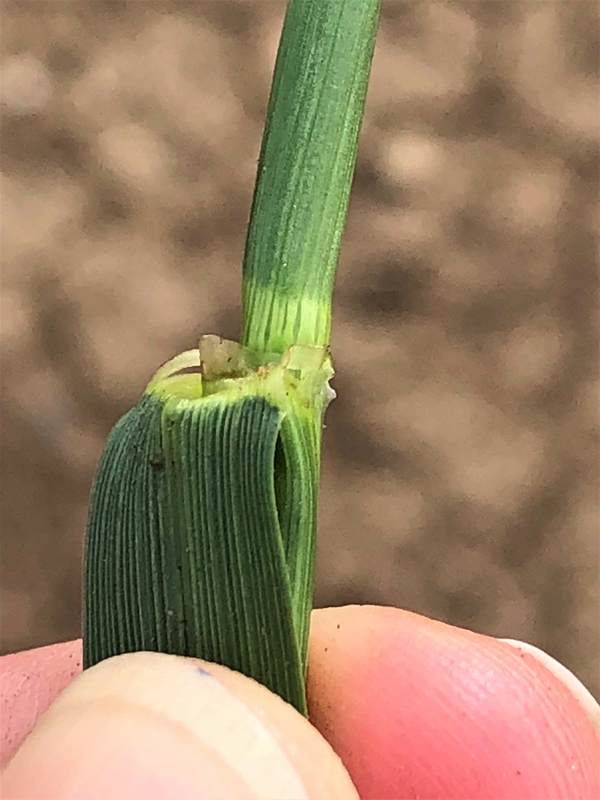 Additional photos can be found at the end of this post; more details regarding Italian ryegrass identification are on the UCIPM website. 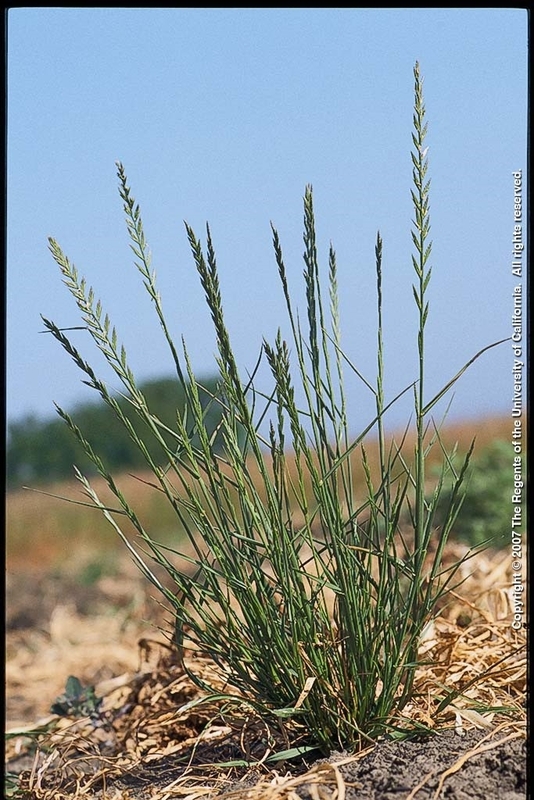 Italian ryegrass has become problematic in the Sacramento Valley, particularly in tree and vine systems and in rainfed wheat acreage. With respect to winter cereals, Italian ryegrass germinates and matures approximately at the same time as the crops and can be extremely competitive for soil nutrients, causing up to 80% reductions in winter wheat grain yield. Across the United State, the control of Italian rygrass in wheat has been compromised by the development of biotypes resistant to acetolactate synthase (ALS) and/or acetyl Co-A carboxylase (ACCase) inhibiting herbicides; this includes Osprey (mesosulfuron-methyl) and (some instances of) Axial (pinoxaden) (http://weedscience.org/). In California, populations of ryegrass collected from alfalfa and orchards have been formally confirmed with resistances to multiple herbicides, which include Roundup (glyphosate), Gramoxone Inteon (paraquat), Raptor (imazamox), Osprey, and several ACCase inhibitors. Last year, Dr. Mariano Galla, a former Farm Advisor in Glenn County, reported that some cereal growers in the Sacramento Valley were also having difficulty controlling Italian ryegrass with herbicides currently labeled for use in small grains (https://ucanr.edu/blogs/blogcore/postdetail.cfm?postnum=28285). 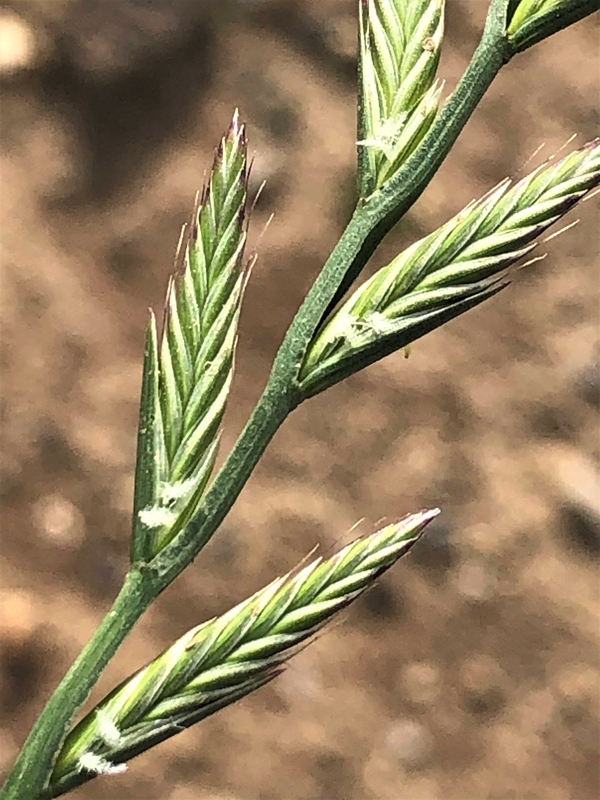 UCCE trials have since been initiated in the Esparto area west of the Dunnigan Hills to compare both chemical and non-chemical strategies for the control of herbicide resistant ryegrass biotypes in wheat. Small grains growers should be strategic and vigilant in their approach to ryegrass. Destroy emerged ryegrass seedlings before planting (following initial fall rains) using cultivation or a burndown herbicide. Make sure that soil clods are crumbled (following cultivation) to prevent ryegrass survival. Apply in-crop herbicides, like Osprey, before ryegrass plants produce more than two tillers to maximize control. Remember to follow label rates, registrations, and instructions. More information about herbicides for the management of weeds in small grains can be found at http://ipm.ucanr.edu/PMG/r730700411.html. Check sprayer nozzles to ensure complete coverage and minimize sub-lethal doses to ryegrass seedlings. Scout fields following herbicide applications to assess herbicide effectiveness and to identify possible resistant plants. Contact your local UCCE advisor if you suspect that weed control escapes make be due to herbicide resistance. Manage ryegrass in ditches and field edges to prevent putative herbicide resistant individuals from becoming established and serving as a source of seed. Figure 3. A membranous ligule.